Las Vegas is famous for many items! 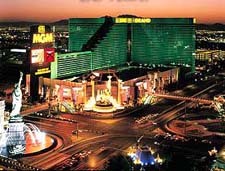 Besides gambling, wedding, conventions, destination resorts, Las Vegas is famous for the size of the hotels. Below we have listed the largest hotels in the world, 15 of the top 20 hotels are located within a two-mile radius within Las Vegas. Also, 23 of the largest 35 hotels by number of rooms are located within the same two-mile radius in Las Vegas. Ranked number one is the Izmailovo Hotel. It is not located in Las Vegas, but in Moscow. One of the most colorful hotel is ranked number 2, First World Hotel, pictured on the right, this multicolor structure is a real eye catcher. The MGM Grand is also pictured to the right, it reigned as the number one largest hotel for years, now taking the number three seat. MGM Grand is not the largest hotel, because the additional rooms they count are co owned by Turnberry and even though they are on the same property, they are not connected, do not have a casino, in many cases their individual rooms are owned by others, therefore, we do not consider it part of the MGM Grand Casino hotel. The Venetian and the Palazzo are two separate casinos next door to each other and not only do they have different names, they are marketed and portrayed as two stand alone resorts. Therefore, we do not count them as one casino, even though they have ownership under the Las Vegas Sands Corporation. The same reasons apply for counting the Wynn Resort and the Encore Las Vegas as two casinos. Even though they are next door to each other, they are marketed and portrayed as two stand alone resorts. Mandalay Bay and THEhotel are considered one hotel because they operate and market together. However, the Four Seasons located within the Mandalay Bay tower is a separate company and those rooms are not counted in Mandalay Bay total room count. The CityCenter Casino in Las Vegas is a collection of several hotels / casinos and is counted separately. * Under construction is the Asia Asia Hotel in Dubai. It is scheduled for completion in 2012, and is expected to have 6,500 rooms. * Caesars Palace is building a new tower, expected completion will have a 29 story tower with an additional 1,017 rooms. * The Fountainbleau Casino is on hold, it should be a $2.9+ billion project which features 3,812 rooms inside a 725-foot, 63-story complex. Expected to open in ?.